Here on the European Springs blog, we like to bring you various news stories relating to the robotics industry, as we know that this is one of the most popular spheres where engineers tend to work. However, despite the rather &apos;glamorous&apos; connotations attached to robotics, it&apos;s a serious business, and robotics could well be the key to overcoming the movement issues of many disabled persons. We&apos;ve talked about bionic limbs and the like before, and have gone into detail surrounding the difficulties that occur when creating an artificial limb that needs to act like a natural one. This latter problem is always the area where robotics experts face the biggest challenges, as artificial devices struggle to replicate natural motion. 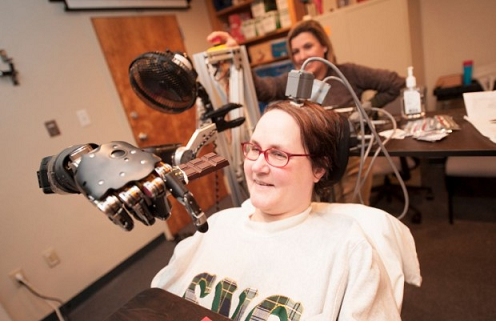 Recently, a significant breakthrough has been made in the case of one paralysed woman, who has managed to control her robotic arm using just her thoughts. Scheuermann Scheuermann had previously managed to achieve 7 dimensions of movement with a robotic arm, but this has now been enhanced to 10 dimensions. Such movements include &apos;high fives&apos;, &apos;thumbs up&apos; gestures, and picking up, grasping or moving motions. Scheuermann has even managed to feed herself using the artificial limb, which is a pretty momentous feat considering that she has been paralysed from the neck down for almost a decade. Scheuermann herself certainly thinks so, describing the experience as having &apos;taken her breath away&apos;. Reported in The Engineer, it&apos;s hoped that this example of the success of a robotic arm will eventually pave the way for the full restoration of movement in such cases as Scheuermann&apos;s. The hope is to enhance the existing systems to the point that such movement can be easily replicated, and also build upon the durability of the robotics too. Once these aims have been realised, these vital innovations could then begin to see use in day to day life. Such revolutionary technology deserves to be more widespread, so we look forward to the day when this finally happens. At European Springs, products like our compression springs see some use in the medicinal and pharmaceutical industries from time to time, and springs from various sources have certainly proven useful when it comes to enabling more natural motion in artificial limbs. Whatever capacity you have a need for springs or pressings though, we&apos;ll always be more than happy to help, so contact us now by calling +44 (0) 208 663 1800 or email info.bec@europeansprings.com to find out more.